Missouri S&T's Solar Village. Image courtesy of Missouri S&T News & Events. Missouri University of Science and Technology has been selected to compete in the 2017 Solar Decathlon, the U.S. Department of Energy (DOE) recently announced. Missouri S&T is one of 16 teams selected from around the world. Missouri S&T’s Solar House Design Team will now begin a two-year project to build a solar-powered, highly energy-efficient house that combines affordability, consumer appeal and design excellence. Missouri S&T’s proposal is titled “SILO,” which stands for Smart Innovative Living Oasis. The project will use innovative technology combined with a psychological focus to make a house suited for single or double occupancy. The team will concentrate its efforts on designing a home that can improve both the mental and physical health of residents. 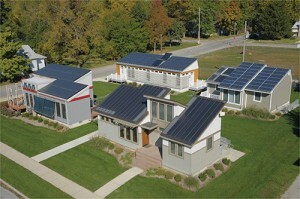 Missouri S&T has built six solar houses for previous competitions – more than any other university.